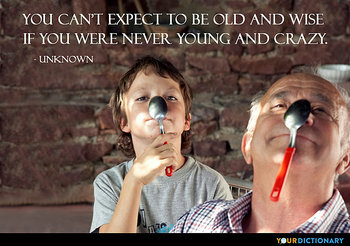 You can't expect to be old and wise if you were never young and crazy. 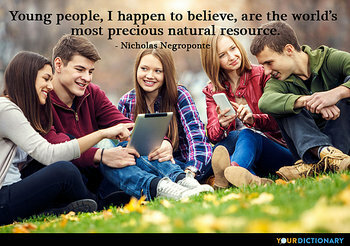 Young people, I happen to believe, are the world's most precious natural resource. Growing up can be a trap, but it doesn’t have to be. We can all be kids, if we choose to. Youth comes but once in a lifetime.  Henry Wadsworth Longfellow, Hyperion (1839), Book II, Chapter X.
I looked like this when I was young, and I still do. Youth are diamonds in the sun, diamonds are for ever.  Alphaville, Forever Young (1984). Young people are in a condition like permanent intoxication, because youth is sweet and they are growing.  Aristotle in Nicomachean Ethics. 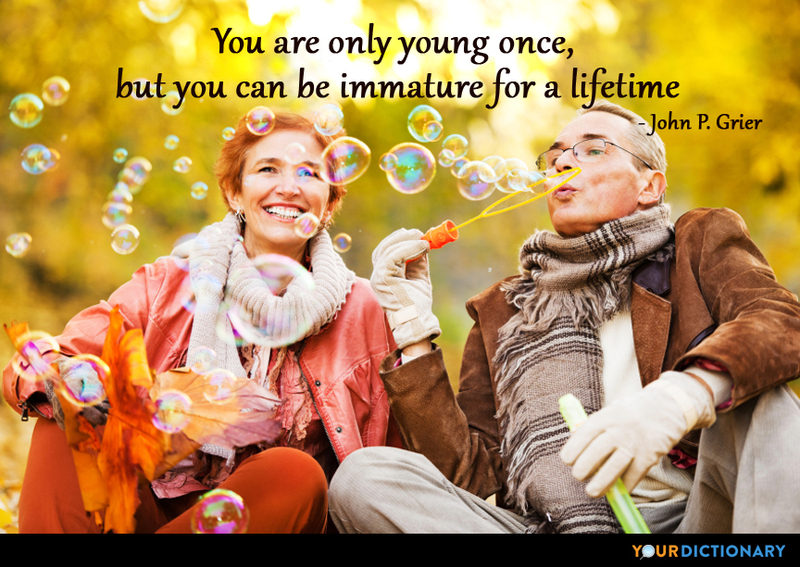 Youth cannot know how age thinks and feels. But old men are guilty if they forget what it was to be young... and I seem to have forgotten lately.  Harry Potter and the Order of The Phoenix (said by Dumbledore). He that is more than a youth, is not for me, and he that is less than man, I am not for him.  William Shakespeare, Much Ado About Nothing (1598-99), Act II, scene 1, line 40. Our youth we can have but to-day; we may always find time to grow old.  Bishop Berkeley, Can Love be Controlled by Advice?. Young fellows will be young fellows.  Love in a Village, Act II, scene 2. And both were young, and one was beautiful.  Lord Byron, The Dream, Stanza 2. A young Apollo, golden haired, stands dreaming on the verge of strife, magnificently unprepared for the long littleness of life.  Youth, line 1, on Rupert Brooke (1915). 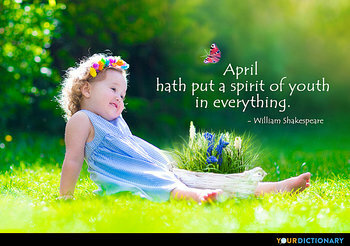 Youth should watch joys and shoot them as they fly.  John Dryden, Aureng-Zebe, Act III, scene 1. Youth holds no society with grief. Ah, youth! forever dear, forever kind.  Homer, The Iliad, Book XIX, line 303. Pope's translation. For God's sake give me the young man who has brains enough to make a fool of himself.  Robert Louis Stevenson, Crabbed Age.  Robert Louis Stevenson, To a Young Gentleman. Bliss was it in that dawn to be alive, but to be young was very Heaven!  William Wordsworth, The Prelude, Book XI. The greatest part of mankind employ their first years to make their last miserable. The foundation of all free government and all social order must be laid in families and in the discipline of youth. Young persons must not only be furnished with knowledge, but they must be accustomed to subordination and subjected to the authority and influence of good principles. It will avail little that youths are made to understand truth and correct principles, unless they are accustomed to submit to be governed by them... And any system of education... which limits instruction to the arts and sciences, and rejects the aids of religion in forming the character of citizens, is essentially defective."